Arisaema triphyllum is a perennial monocotyledon herb living to 25 years (Bierzychudek 1982), ca 3-20 cm tall, from an acrid corm containing sharp calcium oxalate crystals (Kingsbury 1964), roots grow out of the corm in spring as shoot emerges, and die back in late summer as aerial parts senesce and die; roots associated with VA mycorrhizas (Brundrett and Kendrick 1988), base of roots contractile. 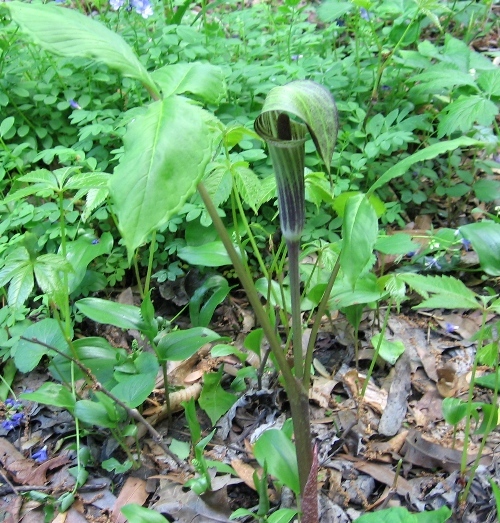 Flowers greenish-white, minute crowded on a fleshy inflorescence spike (spadix); inflorescence bract (spath) brown-purple, arching over slender spadix, April-May, pollinated by fungus gnats and or thrips but most reproduction vegetative, 2-5 ramets per colony (Bierzychudek 1982). 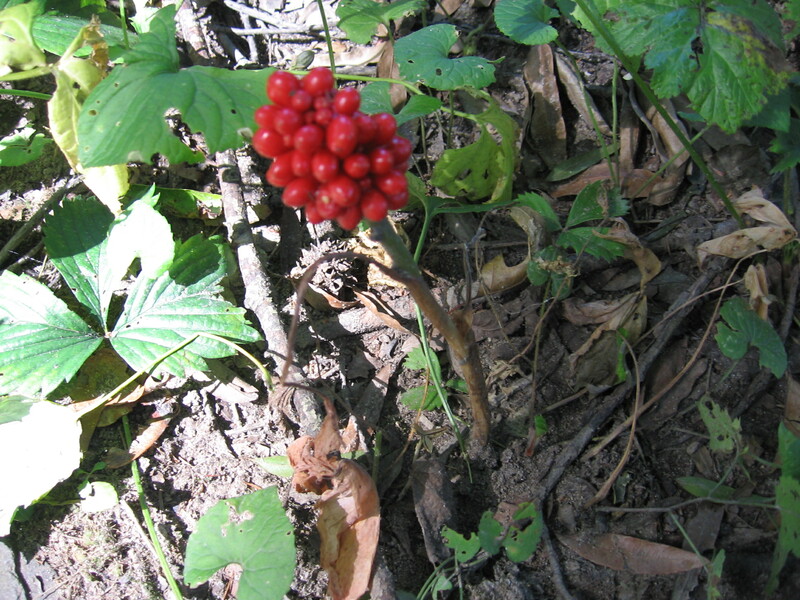 Fruit red, fleshy, 1 cm, 1-seeded. Seed load 39%. Pulp nutrients: water 83%, lipid less than 1%, protein 6%, CHO 27% (White 1989). Pulp contains tiny, sharp calcium oxalate crystals. Fruit eaten by some birds, foliage eaten by pheasants (Martin et al. 1951). Dispersal to and establishment in new sites in successional forest, contiguous to old regrowth stands has been calculated at a rate of 1.43 m/yr (Matlack 1994). Habitat:Undisturbed moist woods and swamp forests and edges in good soil, fairly shade tolerant. Soil pH 4.8-7 but tolerates acid soil down to pH 3.9 (Greller et al. 1990). Notes: Sometimes infected by the rust fungus Uromyces ari-triphylli (Basidiomycotina, Hemibasidiomycetes) which can occasionally be lethal to the plant (Brundrett and Kendrick 1988; Agrios 1988).